Anyway, if you believe it or not, translating the book took more time than writing. I remember that it took me about 15 months to write these 1200 pages. But, the translation itself took more than 2 years. One of the major difficulties was that, although we gave the LaTeX source code to the translator, text being embedded in images and figures was hard to deal with (maybe because I wrote the entire book on a Linux system with xfig for drawing graphics and figures....). 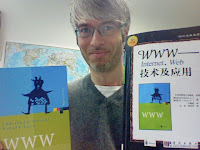 All in all, the translators did a great job and I would like to thank everybody being responsible for the work being done, especially Long Wang from HPI Potsdam for the tedious work of endless proof reading and of course Christoph Meinel for establishing ties to the Chinese publisher Science Press. Here (at dandang.com) you may find a Chinese advertisement for the book (being already) on discount for only 51.60 Yuan (instead of 69 Yuan...).